Occupy Oakland exemplified what for many was the most radical expression of the north american Occupy movement, a radicalness that speaks of the political history of the city. Having begun with a protest camp at Frank H. Ogawa Plaza on October 10, 2011, re-baptised by the protesters as Oscar Grant Plaza after a young man who was fatally shot by Bay Area Rapid Transit Police in 2009, the camp was cleared out by multiple law enforcement agencies on October 25, 2011, and again on November 14th, after a second occupation. Occupy Oakland was also fundamental in the organisation of the November 2nd, 2011 Oakland General Strike that shut down the Port of Oakland, an action repeated on December the 12th. Police again cleared the protest encampment at Frank Ogawa Plaza on November 14, 2011. The last occupation at Snow Park was cleared on November 21, 2011. Occupy Oakland has continued however to engage in political activity. We share below two texts, the first, Occupy Oakland General Assembly’s October 26th proposal for a city wide general strike (a strike whose ambition was not limited to shutting down “economic” sites, but extended to the whole city, as a radical social strike), followed by a letter to the Occupy movement, from participants in Oakland, attempting to clarify and explain some of the questions around corporatism VS capitalism, pacifism and what the so-called 99% actually is. Yes, the 1% have been screwing us, for as long as time. The 99% are reduced to working, serving and maintaining a system that makes us miserable and prevents us from realizing our potential. A growing number of us have been completely expelled from ‘society’ altogether—through homelessness, joblessness, an inability to get adequate healthcare, lack of access to education and other miserable conditions. 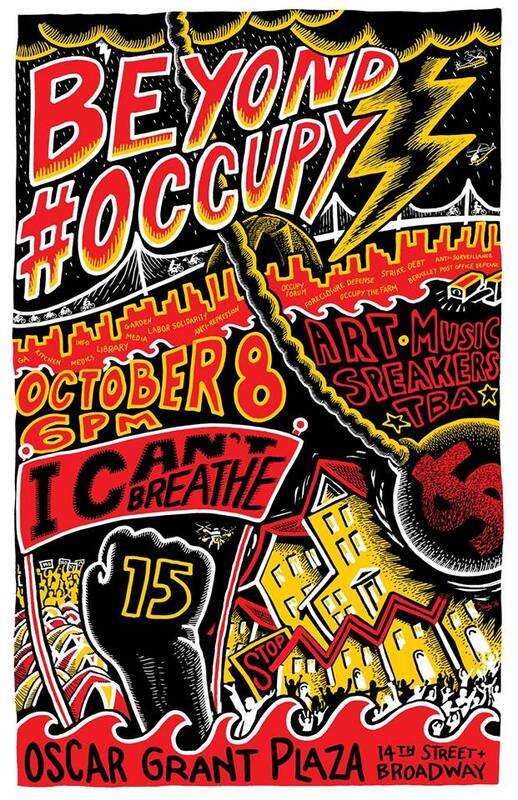 Originally posted: October 10, 2011 at Bay of Rage; re-posted on Libcom.org, 24/10/2011. 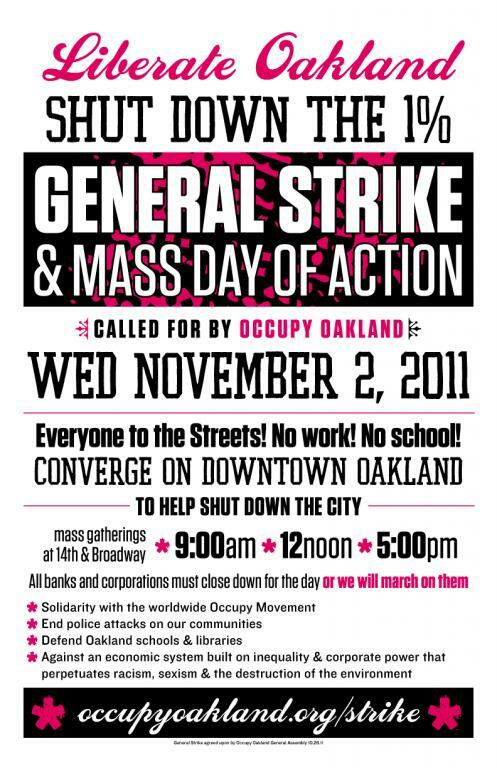 On October 10th 2011, hundreds of people in downtown Oakland occupied Frank Ogawa Plaza in front of city hall. They built a self-organized tent city and began to meet some of the community’s most urgent needs. They renamed the plaza Oscar Grant Plaza in honor of a young African-American man who was shot and killed by BART Police in 2009. Although the action was partially inspired by Occupy Wall Street and austerity protests throughout the world, Occupy Oakland’s particular character resulted from years of struggle and repression in the Bay Area. This short documentary details the ongoing story of the Oakland Commune. It was produced by Marianne Maeckelbergh and Brandon Jourdan with footage from Caitlin Manning, David Martinez, John Hamilton, and tons of archival footage. On January 28th, 2012, Occupy Oakland moved to take a vacant building to use as a social center and a new place to continue organizing. This is the story of what happened that day as told by those who were a part of it. it features rare footage and interviews with Boots Riley, David Graeber, Maria Lewis, and several other witnesses to key events. Video by Brandon Jourdan. This entry was posted in Commentary and tagged Occupy, Occupy Oakland. Bookmark the permalink.